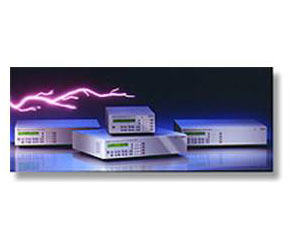 The Fluke line of Programmable Power Supplies was created with automated testing in mind. The GPIB/IEEE-488 interface, output power module and output metering facilities are built in, taking up only two engineering units of rack height. The full rack-width models come equipped with rack mount ears for easy installation in a standard 19-inch rack. The front panel allows full access to all instrument functions, including voltage and current readback. A sequence of front panel settings can be created with the AUTOSTEP mode, quickly creating an automated test pattern of user-defined voltages and currents with no need for a controller. The optional front panel output gives the user easy access to both the power output connections and the sense lines; great for prototyping and temporary setups.